Brrr, it sure is cold out. Yes, you may be wondering why we are seeming so cruel as to remind you that the minute you step outside it is very likely the tip of your nose will frost over… but believe us, we have a very good reason! What may that be, you ask? Well, dear friends, January just happens to be National Soup Month; and so, what better time of year could there be to give the world's most versatile comfort food a month all of its own; especially during the time of year where nothing quite hits the spot like a piping hot bowl of soup? That’s why we have gathered here today, dear friends, to celebrate all that is snuggly and warm! We’re here to pay homage to every broth, bisque and bouillabaisse with recipes that span the spectrum of classic to fantastic! We’ll take you across the globe this week with recipes from hometown USA to Japan, and we know you’ll be wanting to try every one of the delectable soups before the month is done! -messy, we think it would probably be very messy. So, ladies and gentlemen, take a look at the Fineline Settings Bowls we have to offer you for your next steamy soup soiree! 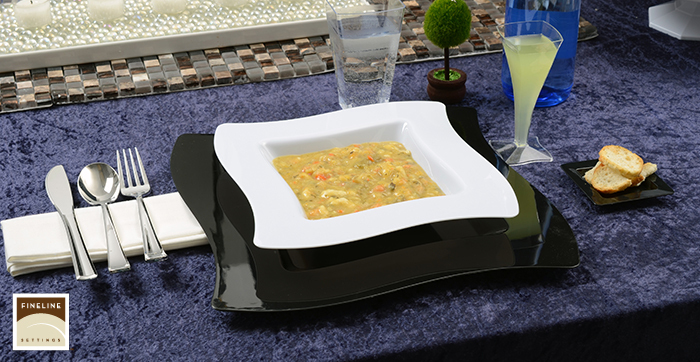 If you’re going for something simple, chic and modern, take a look at our Renaissance 12 Ounce Bowl. This bowl has a fun edge that will make even the most classic of soups look new and amazing! Looking for something a bit more classic? Then our Flairware Bowls are the perfect companion to that Tomato soup recipe you’re dying to try. 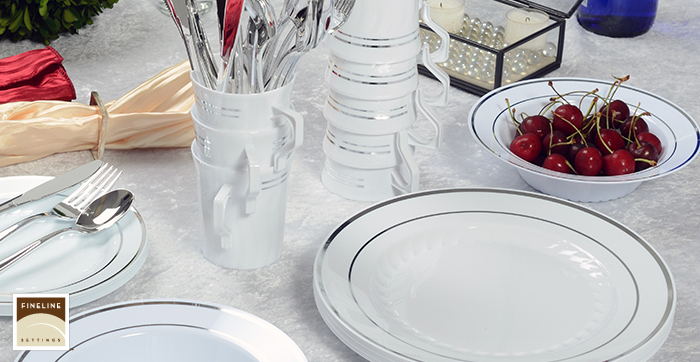 With its rippled design and multiple sizes and colors, it will be perfect for any event! Maybe you want to take high-fashion and class to a new level you never thought could be achieved by disposable plastic; well, friend, then take a very close look at our 12 Ounce Silver Splendor Bowl. This stunning bowl is designed with beauty and quality in mind, and will quickly become a favorite regardless whether you’re serving up soup, salad, or even dessert! 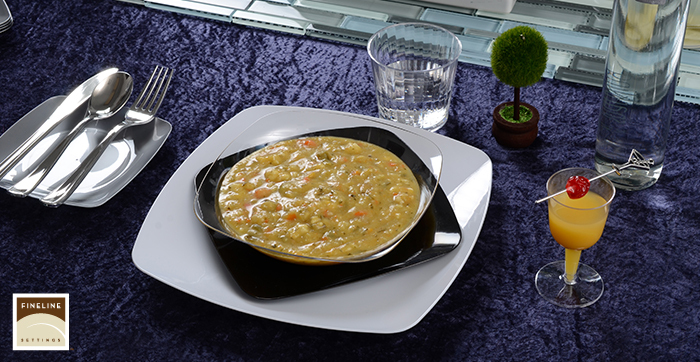 If you’re looking to serve up soup but on a smaller scale, our Tiny Temptations Tiny Tureens Bowls are exactly what you’ve been looking for! Perfect portions to keep your guests satisfied without being bogged down, not to mention… there’s always room for seconds! Now that a variety of soup serving apparatuses have been laid before you, it’s time to fill them up with a selection of some fantastic soup recipes that we know will quickly become favorites! Let’s get stirring! First up, let’s get right down classic! That’s right, folks, we’re talking about the Gramma of Soups: Chicken Noodle. I don’t know if a child in this country has ever NOT had a bowl of this stove top staple; nor does it seem feasible that anyone has the exact same recipe for this seemingly simple tummy warmer. However, if you are looking for another spin on this recipe to keep in your back pocket: our friends, Cheryl and Adam, have been kind enough to share their beautifully photographed Chicken Noodle Soup Recipe! These prolific, professional food photographers share their love of food, friends and one another on their blog Picture Perfect Meals, and will have your mouth watering and your hearts warming! Then you’ll be happy to see that Jaclyn: a mother, wife and self-taught “almost everything culinary”, has been kind enough to share her Slow Cooker Broccoli Cheese Soup! Her Blog, Cooking Classy, is the culmination of all of her passions, and she does a wonderful job of keeping beautiful recipes simple and tasty! Your crockpot will never be the same after you try this recipe! Next, we’re taking you across the world while keeping you comfortably planted in your kitchen! If you love a little Asian zing, then Ashley, over at her blog, Baker by Nature, has the perfect recipe for you! 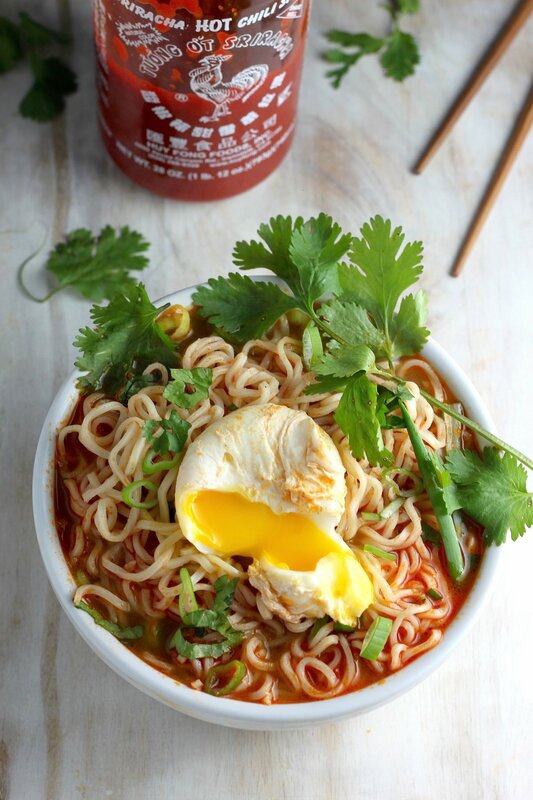 Her absolutely delicious 20-Minute Spicy Sriracha Ramen Noodle Soup will become a staple in your recipe roll! Quick, easy and unique, this soup has everything you love and more! A perfect dish for your college kid! Finally, we were able to come across a recipe that we just could not resist sharing! If you are a sweets person, then the recipe for a Milk Chocolate Soup with Cake Croutons is the perfect dessert soup for you! We all have Amy, over at her blog, Very Culinary.com to thank for this remarkable concoction, and we know this soup will be a big hit with every age! Who says soup always has to be savory? Not us! We think this was a very good way to start off 2015 right! Now that we’ve begun a brand new year full of new and exciting possibilities, it’s time to reward ourselves for braving the chilly weather with a big bowl of soup! We sure hope that you guys liked this week’s post, and that you’ll let us know how these recipes (and our bowls) made your National Soup Month better! If you have a soup recipe you’d like to share- make sure you let us know in the comments below!